Annie Besant is primarily remembered as the international president of the Theosophical Society. One of the most important aspects of her career were the years that she was a professional atheist, which has given her a place in history as a pioneer feminist. 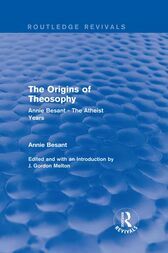 The Origins of Theosophy contains thirteen of Besant’s pamphlets, originally published from 1883-1890. This book is ideal for students of theology.